As the Wage-Profit Conflict Sets In, Troubles Deepen for Global CapitalSurvive Food Crisis – Do you need to read it? | Survive Food Crisis - Do you need to read it? As the recession in Europe painfully proves all attempts at austerity to be dead-ends, the search for the miraculous “silver-bullet” continues. The European Central Bank (ECB) has initiated a negative “nominal” interest rate. That means the ECB, the first monetary authority to ever take such an action in a common currency zone, will be charging commercial banks for the funds they deposit (overnight) rather than paying them interest. The ECB is pursuing an inflation target of 2% with a dogmatic belief that “this is he rate at which agents [read this as financial speculators and the rentiers] will not be affected in their economic decisions.” To this end, it utilizes three sets of interest rates: (1) the marginal overnight borrowing rate of the banks from the ECB; (2) the basic rate for their re-financing operations; and (3) the rate that is applied to the banks’ deposits at the ECB. In order for the monetary interventions of the ECB to have any effect, the rates on these interests ought to be differentiated. Until very recently, the ECB rate on deposits was set to zero, and the rate on the re-financing operations was 0.25%. The decision of the ECB has now been to reduce the latter rate to 0.15% and the deposit to negative 0.10%. The textbook explanation for this unusual negative interest rate on money deposited by banks rests on the expectation that they should be now motivated to lend their funds instead of keeping them in reserves. 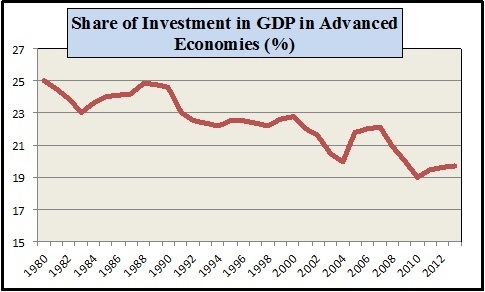 Hopefully, this will restore eurozone economic growth by encouraging more lending for “real” investment. More growth certainly is needed. GDP growth for the zone as a whole was a fragile 0.9% (year-on-year) in the first quarter of 2014 and the IMF forecasts the eurozone’s full-year growth at 1.2%, compared with 2.8% for the United States and 2.9% for the UK. Nevertheless, these observations had not inhibited the storytellers of this epic of austerity. Many now argue that, now that Europe has attained the pre-recession (2007) levels of economic output, it is time to declare victory and pull out. Yet, this post-Vietnam syndrome approach fails to ensure that the European Union as a whole is on an expanding course out of the Great Recession. In fact, deflation continues to be a structural feature of the eurozone’s incurable malaise. With investment expenditures staying rock bottom compared to historical standards, firms are desperately cutting prices to boost their sales. Households, confronted with the ongoing austerity measures, are squeezing their consumption expenditures within a low-demand, low growth—nasty—equilibrium. 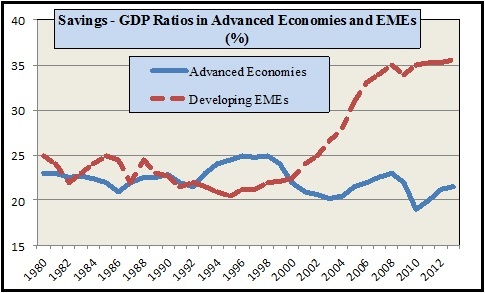 Meanwhile, the “developed world” is neither saving nor investing. As the two graphs below reveal, the developed economies of the globe seem to have shunned the accumulation of real capital, in favor of the debt-driven speculative games of the global casino. But now, another fact comes into play: nominal wage growth rates have started to surpass inflation rates. The Office of National Statistics (ONS) of the UK reports that earnings growth in Britain has risen to match inflation for the first time since 2010, ending a squeeze in wages. Wages (including bonuses) in the UK grew by 1.7% in the first quarter of this year, compared with a year earlier. The annual rate of inflation in March was 1.6% (CPI). Wage growth had been consistently outpaced by inflation since 2008, meaning that the real pay for the average worker had been reduced by as much as 10% over the course of the global crisis. In fact, as Stockhammer notes, wage growth has stalled in most of the European countries before the crisis, and real wages have been falling since. The fear of wage growth comes from a dogmatic belief that for gaining competitive edge in global production real wages have to be squeezed. The European strategy had long been one of a dogmatic attempt to secure a competitive edge based on wage restraint. And now, with the unavoidable rise in real wages, the dictum of austerity sets in once again with calls for further monetary rules to combat this danger. Unfortunately, this dogmatic view continues to direct policy action despite overwhelming evidence that the European economy overall is wage-led and that consumption propensities out of wages are higher than those out of profits. Under these conditions, a strategy of fiscal-driven, wage led-growth would in fact prove to be superior than the austerity-calling trumpets of financial speculation. Any calls for that? This entry was posted in Survive Food Crisis and tagged capital, Conflict, Deepen, Global, Sets, Troubles, WageProfit. Bookmark the permalink.